DETROIT, MI – The official opening Thursday of the Woodward Garden Apartments marks the beginning of the end for a four-phase project that began transforming the Woodward Avenue block between Selden and Alexandrine with the arrival of Great Lakes Coffee, and then later Midtown Detroit Inc. and the Kresge Foundation’s office space, and then the Garden Theatre and Midtown Grille. One of the project’s property managers, Benny Sasser, Jr. , showed us what a two-bed, two-bath units looks like (pictures above). Those 1,200-square-foot apartments typically go for around $1,700 to $1,800 a month in rent. They also have studios that start at about $550. 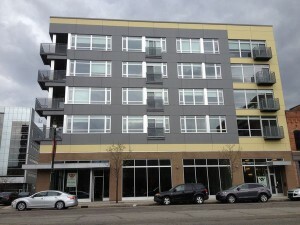 Of the 61 apartments, 45 have already been leased. The apartments are in one of the city’s most development-heavy neighborhoods, where the residential occupancy rate is said to be 97 percent. Some of the ground-level commercial space (also seen above) has already been spoken for as well, with Flagstar Bank, the University of Michigan and Anytime Fitness all signing letters of intent to move in. The $12.6 million apartment development was led by George Stewart, Michael Byrd and William Mosely. It includes mixed-income housing, and the project received a critical $8 million grant from the U.S. Department of Housing and Urban Development.